No sooner than President Obama named 31-year-old lawyer Rashad Hussain to be America's new envoy to the Organization for the Islamic Conference (OIC), did reports surface indicating Hussain has held harshly critical views of his own country's treatment of Muslims. Politically motivated prosecutions, out-of-control surveillance of Muslims and the prospect that internment camps could one day return to American soil are among those concerns he has expressed. 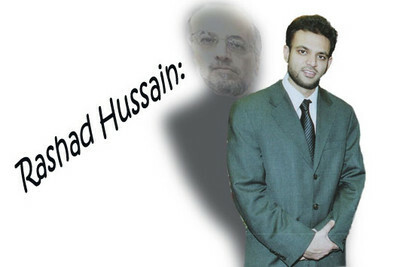 During a 2004 talk before the Muslim Students Association, Hussain reportedly cast the terror-support indictment of Palestinian Islamic Jihad operative Sami Al-Arian as an example of the politically-motivated cases. At the time, Al-Arian was a year away from trial. At least three years later, the Washington Report for Middle East Affairs later removed references to Hussain from its article on the talk, saying comments were incorrectly attributed to him. The White House has indicated that it accepts the magazine's account and that Hussein doesn't remember saying the Al-Arian prosecution was "politically motivated." "A White House spokesman, who asked not to be named, said Tuesday afternoon that Hussain 'certainly doesn't recall making that statement [about politically motivated prosecutions]. He was on the panel to talk about his legal writing on civil liberties. Ms. Al-Arian spoke about her father.'" It is instructive to remember what the message about Al-Arian was in 2004. Laila Al-Arian and other supporters issued the "politically motivated" charge anywhere an audience or news outlet could be found. She still believes it, even though her father pled guilty to providing support to the Palestinian Islamic Jihad (PIJ) after his trial ended in a mix of acquittals and deadlocked verdicts. In his plea agreement, Al-Arian admitted he was "associated with" the PIJ and that he knew "that the PIJ achieved its objectives by, among other things, acts of violence." At his sentencing, presiding U.S. District Judge James S. Moody said the evidence showed Al-Arian served on the PIJ's governing board as its secretary. "Directors control the actions of an organization, even the PIJ," Moody said, "and you were an active leader." In 2004, panel discussions on the case rarely, if ever, offered contrasting points of view. To appear with Laila Al-Arian in front of the Muslim Students Association at that point meant an acceptance of the premise that the case was political. And Hussain can't remember what he said, or what his attitude was? Can he at least come forth now and describe what he does think? If he is to represent America before the OIC, the public has a right to hear those views clearly defined. The OIC has expressed a similar view about American policies and pushed for United Nations resolutions criminalizing what it considers defamation – criticism – of Islam. Any appointed ambassador - even U.S. trade representatives - face Senate confirmation. But that apparently does not apply to the OIC, a body representing 57 Muslim nations. It has a permanent United Nations presence, but Hussain's appointment goes unchecked. He replaces Sada Cumber, who was appointed by President Bush in 2007. There's an argument to be made that the United States has an interest in trying to influence the OIC into doing more to combat radicalism. There's an argument against it, too. If we're going to do it, though, it seems to be a bad idea if the designated envoy harbors some of the same suspicions about America as the Muslim states. As a Yale law student in 2007, he published a paper in the Texas Journal on Civil Liberties & Civil Rights called, "Preventing the New Internment: A Security Sensitive Standard for Equal Protection Claims in the Post 9/11 Era." In it, he raises the specter of internment camps to argue that the U.S. used the September 11 attacks to justify sweeping enforcement action against Muslim immigrants. In a 2008 policy paper for the Brookings Institute, Hussain advocated a politically correct use of language, eschewing references to "Islamic terrorism" and "Islamic extremist" and recommending they be replaced with references to "Al-Qaeda terrorism." Again, Hussain's views wouldn't be much of a public concern if not for his new position representing America, and American interests, before the 57-nation OIC. Engagement needs to be a two-way street, with the U.S. representative steering OIC members to support our policies and objectives. In President Obama's Cairo speech last year, he demanded that "Palestinians must abandon violence. Resistance through violence and killing is wrong and it does not succeed." It's not clear that the OIC agrees. "We reject any attempt to associate Islamic states or Palestinian and Lebanese resistance with terrorism." "Terrorism, to be sure, is not a security issue but rather an ideological one with its political, security and even cultural manifestations. Combating it therefore cannot be by fighting the manifestations but by addressing its core and causes." Given the disclosures, and Al-Arian's acknowledgement that he performed services for a terrorist organization, has Hussain changed his thinking about the case? If so, when did it change and in what way? If not, is he a good candidate to represent American interests with the OIC? The public deserves answers to these questions.